Going back to a time before the internet, one way to discover bands was via killer mags such as Hot Metal or imports from Europe or America. On very, very rare occasions, Rage on the ABC would show maybe six to eight metal video clips in a row. On one particular rare occasion, I was lucky enough to see a clip from Austin Texas (U.S.A.) progressive metal act Watchtower. The song was The Eldritch which was lifted from the band’s second album for Euro metal label Noise, titled Control and Resistance. But buying albums by some of these lesser known metal acts was challenging back in the day. If you could find a store that would carry any kind of metal section, that was a good start. If their prices were reasonable or better than reasonable, that was a miracle. Over time, albums went out of print for different reasons. Thankfully, labels such as Divebomb Records are doing their part to bring hard to find gems back into circulation. 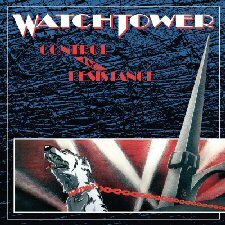 One of their most recent releases is the reissue of Watchtower’s Control and Resistance. Unlike some of the other recent reissues and reduxes, this re-release of Control and Resistance is a track for track carbon copy of the original pressing with the exception that it has been re-mastered by Jamie King at his Basement Studios in 2012. Watchtower was without doubt ahead of their time. Part thrash, part metal, part prog and totally ahead of their time, these Texans have been cited as influences by the likes of Dream Theater, Atheist and even Death. The screeching vocals of former Hades vocalist Alan Tecchio are as much a part of the signature sound of this album as guitar freak Ron Jarzombek’s schizophrenic style and the fervent rhythm section of bassist Doug Keyser and drummer Rick Colaluca. Whilst The Eldritch will always be “that song” that I associate with Watchtower, it’s the tip of the iceberg for this album. It’s probably the most accessible song on offer as the other seven tracks are challenging, dynamic, and bounce around like a frog in a sock. They really do change tack without notice and through up more curve balls than you could imagine. It makes for one hell of a rollercoaster ride over the course of the eight tracks in total. Watchtower were way ahead of their time and for the many prog metal fans out there today that worship at the altar of Dream Theater, thanks to Divebomb Records, this absolutely criminally underrated metal gem is available once more. If you really want to appreciate today’s prog metal, take the time to go back and find out about one of the most important acts of the past. It is time well spent.